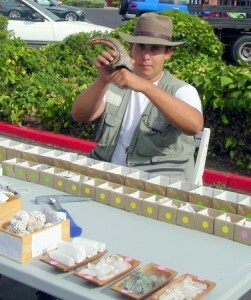 Meet geologist and paleontologist Joseph Rotstein — he brings his array of minerals and fossils to the market. Lots of fun to look at and he is a wonderful source of information. He offers something different for children’s parties too. 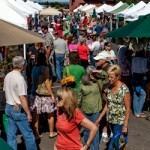 The Wednesday Santa Rosa Farmers Market is a great place to re-charge for the rest of the week. 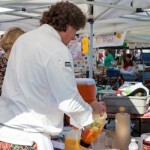 Meet the rest of the Wednesday vendors. It’s a beautiful spot for coffee, breakfast or just sit a spell. Shopping is easy and fun! 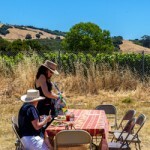 As some of you may know, the California Department of Food and Agriculture recently created an Ad-Hoc committee to look into various issues related to direct marking. 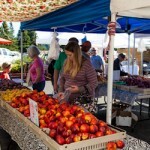 This committee addressed a number of topics, including changes to farmers’ markets and farm stands. Out of that committee has come a list of draft recommendations. I’ve attached a copy of the document for you all to review as some of the recommendations will impact you directly. The changes currently proposed are significant and the more voices providing input the better. 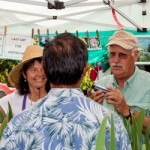 After establishing a baseline, the farm stand and selling committees merged. § Establishing guidelines and an enforcement model to mitigate the misrepresentation which occurs at some roadside stands. § Providing a structure which would allow for additional direct marketing opportunities, specific areas where traditional methods, i.e., CFMs, may not be successful. 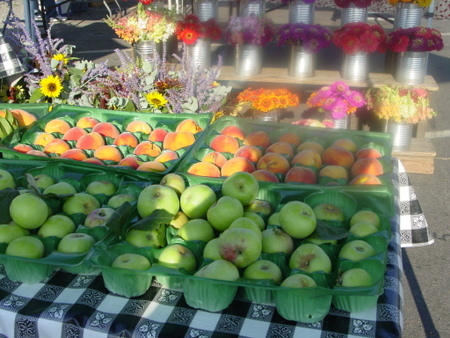 § Establish changes to the California Food and Agricultural Code which would allow registered direct marketing producers to transport for sale and sell California-grown fresh fruits, nuts, and vegetables that they produce, directly to the public, which produce shall be exempt from size, standard pack, container, and labeling requirements, at a certified farmers’ market, field retail stand, or farm stand subject to specified conditions. 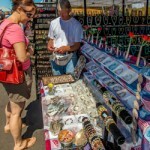 § Recommended that all roadside vendors must be registered by the Direct Marketing Program. Any ag product sold must have a permit with the County Health Department, have a produce handler’s license (under applicable circumstances), and proof of ownership. § Establish language which would make the selling of agricultural products on a public right-of-way a citable offense under the Vehicle Code without proper permits and/or authorization. 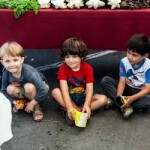 Leveraging a three-tiered approach, the California Model for CSA’s has been designed to identify and define the existing forms of marketing occurring in California. The CSA subcommittee also reviewed issues impacting the selling of potentially and non-potentially hazardous foods and mechanisms to ameliorate potential food safety issues. One of the central requirements for all CSAs is that the products are sold prior to delivery. § Identifying permitting, licensing, and registration structure as well as enforcement mechanisms. § Establish a Single-Farm CSA or CSA category (everything from one farm or a legal cooperative of farms) must be sold prior to delivery. Direct Marketing Single Farm or Cooperative/Association handling or producing potentially hazardous foods that meets USDA/CDFA requirements. Exempt from environmental health permit. Multi-Farm CSA producing or handling potentially hazardous foods Environmental health permit required. 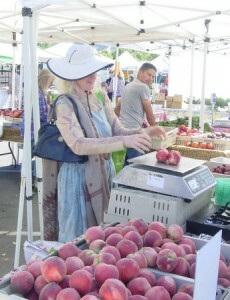 Establish a multi-farm CSA – all products must come from a group of registered direct marketing California farms and must be sold prior to delivery. This is the most common form of CSA in California, where a farm buys some products from other farms. 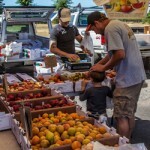 The subcommittee is considering language that would require the operator to identify the direct marketing registrant that they will purchase the products from on an annual basis and potentially specify the maximum number of direct marketing producers associated to each multi-farm CSA registration. The CFM Subcommittee has determined that the current model should be kept in place as the primary structure for certified farmers’ markets. The CFM subcommittee explored options to improve and extend the scope of the Direct Marketing Program. These areas include enhancing county enforcement uniformity, examining regulations that are unnecessary or burdensome to industry, and reviewing potential regulations to streamline certification and enforcement.  Providing tools for a consistent CFM structure through market manager training. The CFM Subcommittee explored several issues concerning program recalibration, which resulted in the creation of the following recommendations. 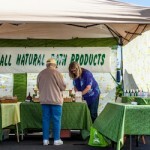 The CFM Subcommittee’s underlying premise was to ensure a wide range of viable direct marketing opportunities for California producers via certified farmers’ market. 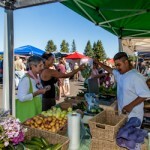 In addition, the CFM Subcommittee focused on removing the onus that is on the state, counties and farmers’ markets of warranting or certifying that a grower is only selling what they grow themselves, and instead place the responsibility of such representation squarely on the grower selling to the public. Enforcement is to be concentrated on overt false and misleading representations made by the grower, rather than paper documentations and representations. Assessments on the industry are earmarked for investigations of such conduct, and penalties are concentrated and designed to be a deterrent to such conduct. 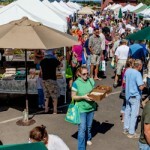 Building upon the work completed by the Technical Planning Committee, several goals and overarching ideas have been established, including: Establishing a robust, well-run, well-enforced certified farmers’ market system; improving enforcement, establishing enforceable regulations, and providing adequate funding; Providing clear communication throughout the Direct Marketing Program (e.g., public, growers, managers, and enforcement staff); Promoting California grown produce, and; Increasing opportunities for farmers. In addition, the public wants reassurance of grower and market integrity. Growers want a fair and level playing field. 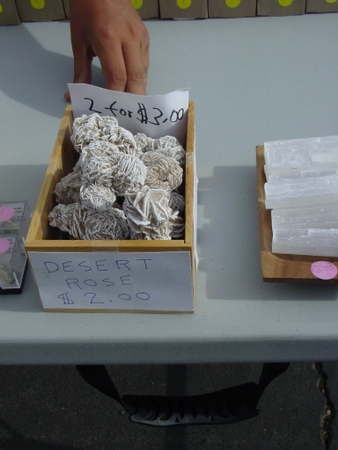 The public and honest growers deserve protection from abusers of the direct marketing system. Managers and enforcement need their jobs to be doable and effective. Certification is the tool and “badge” for grower legitimacy and consumer confidence. For maximum effectiveness, enforcement and compliance should start at the very beginning of the certification process—with the application. The third major underlying premise is that the marketing advantages of having standard pack and grading standards have diminished dramatically in recent periods. Exemption from the documentation and process burdens imposed should therefore be expanded to enable the grower to invent and innovate ways to market their production directly to the public, thereby improving their relative economic viability. 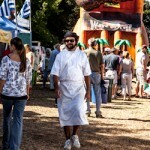 The fourth major underlying premise is that public concerns of food safety and traceability of food sources have emerged. Although the food borne illness impact of products from a small farm production sold intrastate might be minor, a system of source identification signage and labeling along with recordkeeping ensuring traceability would seem to be reasonably necessary. The alternative of complying with GAP audits designed for large farms that sell in an aggregated or interstate market system does not. 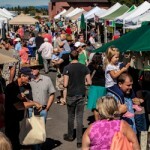 The final premise is that the state should not be interjected into the private disputes, rulemaking or contractual affairs between growers and market outlets. There is civil code and case law, and a legal system already in place to deal with such matters.  Add a new section under the Food and Agricultural Code that establishes a prohibition and penalty section for intentional false, deceptive or misleading marketing of Agricultural products similar to that of Section 17500 of the Business and Professions Code. This proposed addition would specifically address misrepresentations concerning geographical area of production, the identity of producers of an agricultural product, and the manner and methods of production of an agricultural product. Active enforcement of the section on all segments of the food marketing, not just direct marketing, is the reason it is placed in the general provisions of the code rather than in a specific portion. Actions under this section may be initiated by the Secretary or by any agricultural commissioner on behalf of the secretary. Funds generated from penalties would be specifically earmarked for actions under this section, and for contracting with agricultural commissioners for aid in such actions. In addition or in lieu, punitive action may also be taken against any applicable license, permit, or registration of the accused. 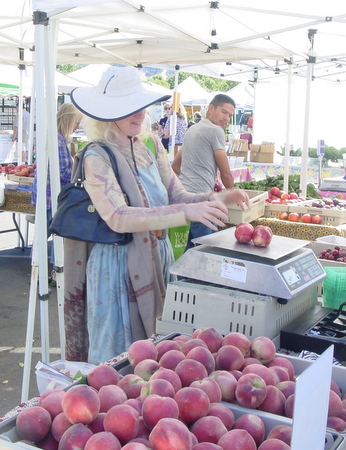  Make corresponding changes to the California Code of Regulations specifying that all products sold at certified farmers’ markets shall be California grown.  Amend the Food and Agricultural Code to establish a consequence for intentional false and misrepresented use of the “California Grown” label.  Repeal existing Food and Agricultural Code provisions regarding certified producer’s certificates and develop legislation that requires a Direct Marketing Producer registration, documentation and inspection verification system. This would require all producers who wish to sell their agricultural products directly to the public to register and be assigned a permanent number for their farm. Additional cropping and production document information is also required to be filed with the state. All registration fees are paid to the state, such fees to be used in part for the creating and maintaining of an online registration and producer data filing system, and for production site verification inspections pursuant to any properly submitted complaint or pursuant to information received or detected causing the necessity for such site inspection (the state can contract with counties for help in this regard). In addition, accurate sales recordkeeping is required. This recordkeeping is to provide a means for food illness outbreak traceability assistance. This coupled with the registration, will serve to satisfy the applicable “approved source” condition of the Health and Safety Code. 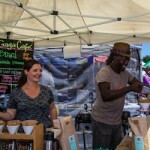  Specify that CDFA shall not mediate disputes between vendors and markets. Language pertaining to the rulemaking of CFM operators must rewritten to clearly define nonprofit or other qualified operators (non-government operators) to be private entities whose rule making powers are abridged only by the condition that they be uniformly applied and in a nondiscriminatory manner.  Impose a Direct Marketing Program fee assessment on market operators. Such program fee is to be used for the purposes of the chapter, subject to the advice of the Ad Hoc Domestic Direct Marketing committee. Include a separate special Investigation and Enforcement fee assessment on each of the above market operators. The money generated by the imposition of the fees assessed under this section shall be used exclusively to pursue and conduct investigations and enforcement actions upon properly filed complaints of any violation of Section 890 of this California Food and Agricultural Code. This section has a sunset clause. 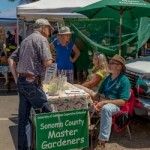  Convert the present Certified Farmers’ Market Advisory Committee into an Ad Hoc Domestic Direct Marketing Advisory Committee. Committee existence and composition is discretionary to the Secretary to whom such committee is advisory. Intent is to create a broader advisory committee to the Secretary that is composed of representative agricultural groups and organizations, growers and the public interested in the orderly advancement of the domestic direct marketing of California agricultural product.  Establish requirements for second certificates, such as visible source labeling.  First time Applications. There shall be an onsite inspection of a new applicant’s production sites. Ideally, this inspection will include GPS mapping to include access points and well locations. The office process shall include basic instruction by CAC.  Renewals: For certified producers in good standing, producers will submit map, crops, etc as specified in the application, noting any sites or crops that are changes from previous year’s certified producer’s certificate. Onsite inspection not required unless there have been substantial changes (major amount of new commodity, new or different production site). changes, and; the term ‘renewal’ at top would help county agricultural commissioner and managers know at a glance where things stand.  For certified producers who have had any violations: Mandatory annual inspection.  Improving the CP application and ensuing Certificate will provide substantially more at-a-glance information in the field and at the market for CAC and market managers, including much-needed cross-county information. Asking the grower to provide details at the outset opens education channels, makes boundaries clear, and establishes a seriousness of purpose.  Develop Market Manger Certification Modules; join inspection training modules for state and county staff; multi-lingual informational brochure that communicates the basic regulations. AOL did a survey and beets came in 7th on the list of America’s most hated foods. Liver was first. There were no beets planted in the White House Kitchen Garden project. But don’t count the beet out yet. According to NPR, the beet is enjoying a renaissance: ” Does all this constitute a beet renaissance? Irwin Goldman says, absolutely, yes. He breeds beets at the University of Wisconsin, where he’s a professor of horticulture. He has been waiting for this renaissance for years. “I think it’s just wonderful to see because it’s just an incredibly fabulous vegetable that I think is totally under appreciated,” he says. We have to give a big hurrah to the Hollywood Farmers Market for having a Beet Fesitival (recipes are great) and for using a Tom Robbins quote to promote the event. 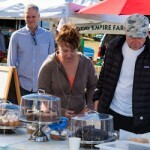 The only other festival was the Schrute Farms Beet Festival so we are glad to see The Hollywood Farmers Market give the beet it’s due. Some of you may only think you hate beets —From Fine Cooking Think You Hate Beets Think Again or maybe you really do hate them but could learn to love them– Martha Stewart has a lesson for you! There are beets all over the market and every farmer has something different. 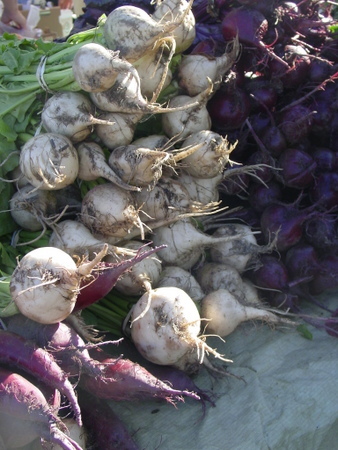 There are big beets, baby beets, orange beets, stripped beets and check out this picture — white beets – New Family Farm Saturday market. 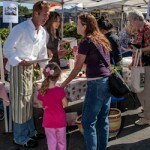 Choice is what makes the farmers market so wonderful. You can find the perfect beet for your special recipe. If you are just starting out on a beet adventure. Here’s some beet background. 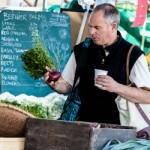 You too can be a food trend setter -beets are hot for 2012. Anyone who says they have the best beet recipe -period deserves a look. Let’s get beets off the 10 most hated foods list — the beet deserves another chance. Got the mid-week- bored- blues? 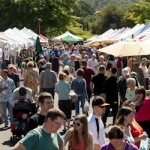 the perfect-pick-me-up is the Wednesday morning market at Luther Burbank Center for the Arts. 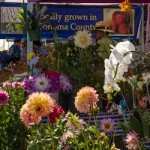 Outdoor tomatoes grown in Sonoma County are here all varieties from early girls to heirloom. 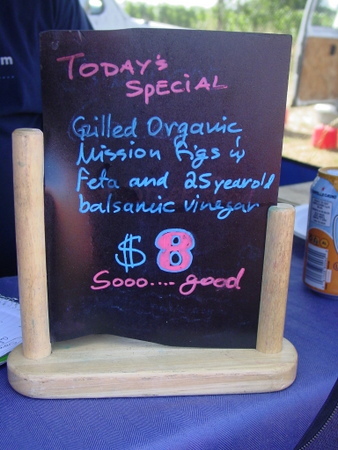 Amazing bacon is available from Dream Catcher Ranch and The Windsor Green Grocer. Full Circle Bakery has the perfect bread for your BLT – no matter what that choice is. And while lettuce is often treated as just an accessory, we disagree and think it needs to be crisp and crunchy. Find your perfect lettuce at Min-Hee Garden. There are lots of varieties of lettuce in market now. If you’d rather have someone else make your BLT – we nominate the Windsor Green Grocer. We believe his BLT belongs in the Sandwich Hall of Fame. 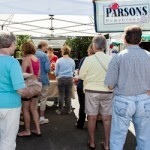 And you can have it during BLT season at the Wednesday morning market. If you are not a fan of bacon- skip the b and add any number of wonderful seasonal options – cucumbers, gypsy peppers, or try a slice of perfectly ripe peach! 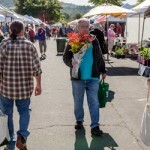 The Wednesday market has duck eggs, chicken eggs, coffee beans, coffee, coffee drinks, pastries, bread, jams, condiments, beef, duck, pork, bison, salmon, halibut, cod,mushrooms – varieties of fresh and died, honey, beeswax products,seasonal produce and fruit . 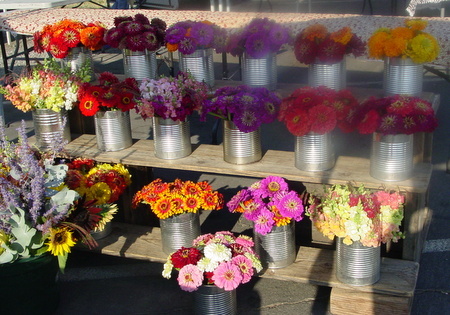 Wednesday only vendor Ridgeview Farm has the most beautiful seasonal bouquets and full bunches of zinnias. 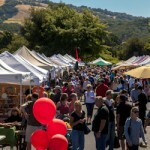 There are also handcrafted soaps, unique jewelry and items crafted from old silverware, and beautiful hand-sewn napkins, shirts and more. In ancient Greece Figs were regarded with such esteem that laws were created forbidding the export of the best quality figs. Sycophant derives from the Greek word meaning one who informs against another for exporting figs or for stealing the fruit of the sacred fig trees. The word came to mean a person who tries to win favor with flattery. The California Fig Board has everything you need to know about figs. Figs are fat, sodium, and cholesterol-free. If your only experience with a fig is in a newton — you have a wonderful treat waiting for you. Just eat one perfectly ripe fig and you will be hooked for life. Figs DO NOT ripen off the tree – only buy ripe figs. 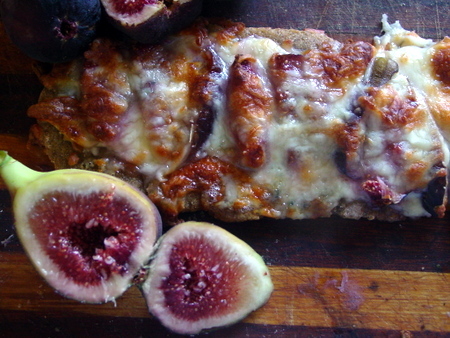 Here’s a discussion about what to do with figs besides just gobble them. 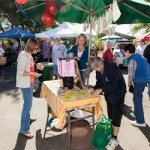 Figs are currently at the Wednesday and Saturday markets at the DeSantis Bella Fruita Stand. There are a number of varieties of figs and each is in season for a very short time. Enjoy fresh figs now. Bobby’s Ultimate Souvalki recently featured grilled figs with 25 year old balsamic vinegar and how about a grilled cheese sandwich with figs and tomme’ fresh cow’s milk cheeese* from Weirauch Creamery . Both are at the Saturday market. *If you are into lily gilding you could add some pancetta from Franco Dunn’s One Wold Sausage company or bacon from Black Sheep Farm or TheDream Catcher Ranch. Here are a few quick and easy recipes from About.com for fresh figs. Cucumber or melon? It tastes good! 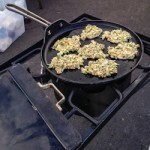 The Armenian cucumber has become the snack of choice for many of our vendors. Ask for a taste and you will be going home with at least one of the weird looking fruit that acts like a vegetable. Easy to use — no peeling or seeding required — great taste, crisp and juicy. The Armenian cucumber, Cucumis melo var. flexuosus, is a type of long, slender fruit which tastes like a cucumber and looks somewhat like a cucumber inside. It is actually a variety of muskmelon (C. melo), a species closely related to the cucumber (C. sativus). 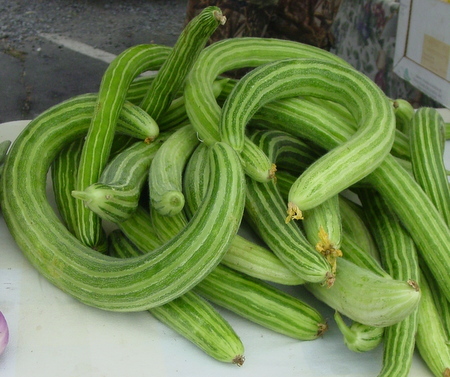 It is also known as the yard-long cucumber, snake cucumber, snake melon, kakri in India, Atta in Egypt, feggous or fakkous in Morocco, acur in Turkey, φακούσι (fakoosi) in Cyprus and uri in Japan. It should not be confused with the snake gourds (Trichosanthes spp.). The skin is very thin, light green, and bumpless. It has no bitterness and the fruit is almost always used without peeling. The Armenian cucumber, AKA Yard-long melon and Snake melon, is defined within culinary terms by its appearance, however, it is botanically classified as a melon. Its scientific name is Cucumis melo var. 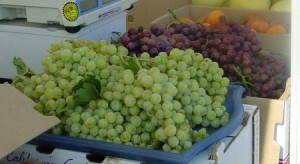 flex­u­o­sus and it is a member of C. Pepo family along with muskmelons and honeydew melons. The Armenian cucumber is actually the fruit of a flowering and tendril-bearing vine. The fruit, by definition, is the part of the plant that bears its seeds. The Armenian cucumber is thin, elongated, curved and often irregularly curled with a creamy pistachio green colored skin that is textured with smooth longitudinal furrows. Its flesh is crisp, succulent and mildly flavored, similar to a common cucumber. Ideal sized Armenian cucumbers will range in length from 10-15 inches. Longer cucumbers will tend to be not just over-sized, but also overly mature with less moisture content. The Armenian cucumber is entire edible. There is no need to peel the Armenian cucumber. Its thin skin makes it an ideal fresh slicing cucumber. 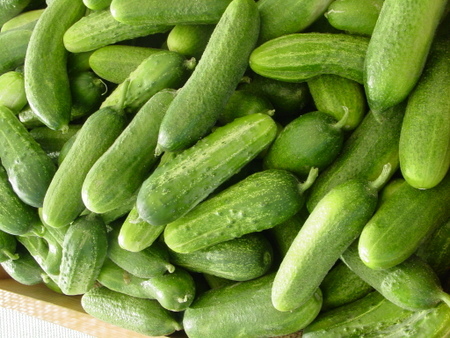 Armenian cucumbers favor being served raw in green leaf, chopped salads and pasta salads. Their delicate flavor allows them to become a perfect textural component in sandwiches and sushi. They can be sliced lengthwise, widthwise, diced and julienned. The Armenian cucumber can be grilled, puréed or pickled. Complimentary ingredients include red and white fish, shellfish, chiles, tomatoes, mint, oregano, yogurt, garlic, cumin, chicken, pork and fresh cheeses such as feta and chevre. Armenian cucumbers should be refrigerated until ready to use. 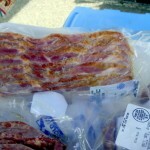 Once cut wrap in plastic to extend its shelf life. As its name suggests, the Armenian Cucumber is native to Armenia. Its initial cultivation is dated back to the 15th Century, which puts it into the category of ancestral varieties. This takes greater historical precedent over heirloom. Ancestral varieties were introduced into the human diet when the only foods eaten were whole, unprocessed, easier to digest and metabolize, generally predating the 19th century. Today, ironically, or perhaps because of migration and the natural distribution of food that follows, the Armenian cucumber can be found growing more in California than in Armenia. 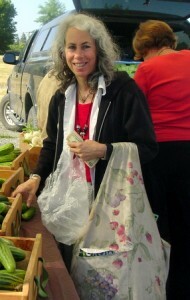 Veggie Queen Jill Nussinow shopping for cucumbers for pickling at the Beet Generation Farm , Wednesday and Saturday Market. Min-Hee Garden, Armstrong Valley Farm, Redwood Empire Farm are all at both the Wednesday and Saturday markets and have a wide variety of cucumbers. The Veggie Queen’s Note: You can stop the fermentation any time that you like the flavor of the pickles. You must pay attention to your pickles daily. Here is her basic recipe for pickles and some ideas for variations. 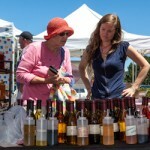 The Wednesday market is the only Santa Rosa market Ridgeview farm attends. 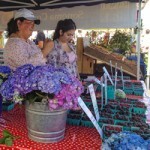 They have the first apples of the year and Ridgeview is also home to wonderful seasonal flower bouquets. Right now -it all about zinnias. Zinnias are long lasting and come in beautiful bright colors — perfect for summer. 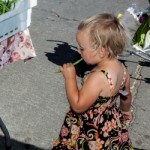 Ridgeview also has lettuces, fresh herbs and french breakfast radishes. 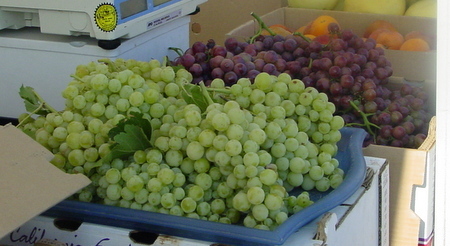 DeSantis has the first table grapes of the year – crisp and crunchy – table grape varieties you won’t find at the grocery store. 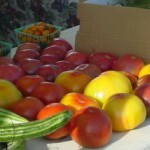 Redwood Empire Farm has tomatoes big and small. The Patch should have tomatoes this week too. 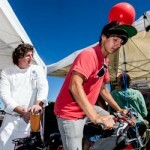 This is 33,000 words about our Grand Opening Party. 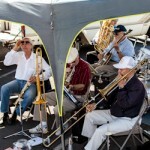 The teeny, tiny but very special Thursday market returns TODAY July 12 to it’s spot near Coddingtown Mall. 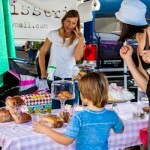 Although this market is specially for WIC* recipients it is of course open to the public. 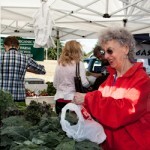 Fruit and vegetables are emphasized but it’s got the best of everything including wonderful prepared foods featuring the wonderful farm market breakfasts of the Windsor Green Grocer. 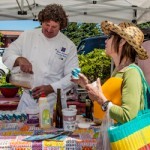 Today Chef Elizabeth Eichhold will be demonstrating seasonal recipes. Thursdays 9:00 a.m. till 1:00 p.m.
*The Special Supplemental Nutrition Program for Women, Infants, and Children – better known as the WIC Program – serves to safeguard the health of low-income pregnant, postpartum, and breastfeeding women, infants, and children up to age 5 who are at nutritional risk by providing nutritious foods to supplement diets, information on healthy eating including breastfeeding promotion and support, and referrals to health care.